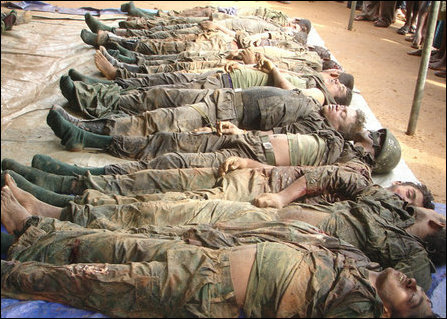 Photographs of the dead bodies of the Sri Lankan soldiers, recovered by the LTTE, has lately exposed Colombo's use of fresh recruits from the south in the intensive battle front in Ki'linochchi. 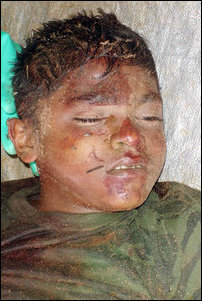 The latest photo has also revealed that Colombo is victimising Sinhalese children in its offensive front in Vanni. 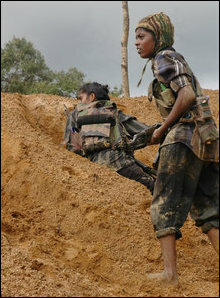 10 dead bodies of the SLA soldiers were recovered by the Tigers Tuesday evening. 8 more bodies were recovered later and 10 further recovered Wednesday morning. Three identity tags of the SLA soldiers were shown by the Tigers. S195842 (SR.CO.UY, B+ve), S1369682 (B+ve, DCOY, 12 SLSR), S371790 (A+ve, ACOY, 12 SLSR) and S318855 (Vijayabala DM, 73 LLI). Only a few soldiers were carrying identity tags or documents while being engaged in the offensives in Vanni. 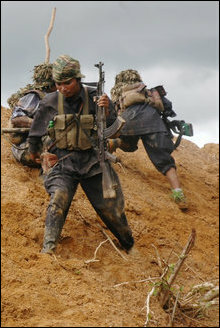 The Tigers said they have seized several weapons in the clearing mission. There was still exchange of gunfire and minor clashes that continued in Malaiyaa'lapuram and Kugchupparanthan areas according to the latest update Wednesday morning. The SLA had launched the multi-front push towards Ki'linochchi through Malayaa'lapuram, Kugnchupparanthan, Mu'rika'ndi and Pulikku'lam. The Tigers said the SLA move was repulsed. The army has also suffered heavy casualties in the Jaffna front at Ki'laali where it launched an offensive push in the early hours of Tuesday amid heavy rain. 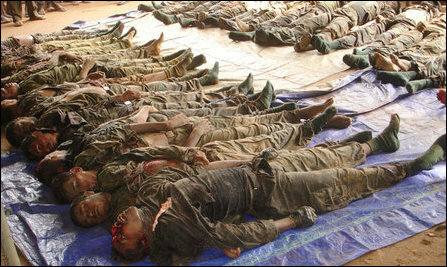 There were more dead bodies lying between the LTTE and SLA defence lines, according to the latest updates from Ki'laalli front.